I like Alvarez. My MFA70 is all wood and is a pleasure to play. Not in the same league as a Guild or Martin, but a great value. I think years ago they made a laminated maple backed mid size model. I’ll have to check. Tommy, your F44 is gorgeous! I love quilted and fancy grained maple. Glenn, Thanks for the heads up on that GC one. I really hate their lack of disclosure (and ethics) in their online listings. It’s too big for me anyway. 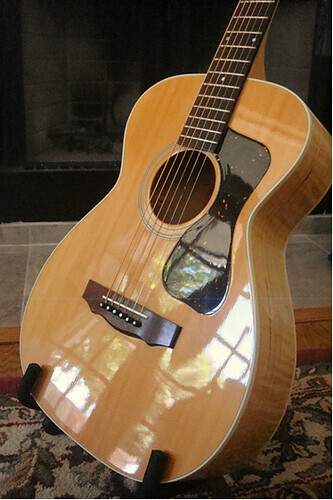 My backup plan is perhaps to find a nice NH F30R as a possible replacement for my Martin ( which is sensational). The difference would allow me to put a little more towards a maple something. Last edited by HeyMikey; 02-10-2019 at 02:21 AM. ...and saw reference to a GSR F30 maple, but my guess is that would be a little pricey. There were only 20 GSR F-30 Maple built in New Hartford around 2011, 10 for the US and 10 for overseas, hence a bit rare. Yeah, sorry about that Tommy. Ralf, that F20 maple is beautiful no doubt. I’m thinking about a maple sound I have in my head. It’s a big, rhythmic sound with good low end. Like a really nice old Dove. An OM will be hard pressed to get near there but I like the OM balance and know what to expect and what not to expect. I don’t think anything smaller will get me the sound I want. I won’t rule it out but I’d have to play it first. This has become an educational thread for me - never knew there was a maple F20 - very sweet! And so is that F20 GSR! I’m thinking about a maple sound I have in my head. It’s a big, rhythmic sound with good low end. Like a really nice old Dove. An OM will be hard pressed to get near there but I like the OM balance and know what to expect and what not to expect. I don’t think anything smaller will get me the sound I want. I won’t rule it out but I’d have to play it first. Mikey, I like maple guitars a lot, and have a lot of them. It's generally rather difficult to pull a deep bass note out of a small maple body, and I'm guessing you'll be hard pressed to get what you're after if you go smaller than a 16" body (especially something in the neighborhood of an old Dove sound). But I'll throw out one more model for you to consider because it appears to be in the size category you're after. The Gibson CJ-165 (& J-165) is a 15" mini-jumbo. The body is considerably smaller than a J-185 (I happen to have both of them next to each other as we speak), while the depth is similar. Both instruments share the 24.75" short-scale length. The CJ-165 was produced in both a rosewood and maple version. It was released in 2006, with a cutaway version added to the lineup the next year. The '07 & '08 cutaway has a soundhole mounted Fishman Aura. All following cutaway versions had side-mount electronics. Mine is an '07 cutaway, with a maple body and neck. I own 17, 16, & 15" Guild and Gibson jumbo-shaped guitars - all in maple, except for the 15" Guild F-30R. In each case, the bass produced by these maple bodies is predictably noticeable as you step down in size. But there's a combination of tonal characteristics that makes each size attractive. The CJ-165, being the smallest of these, carries less of a bass punch, but has a balanced ringing tone across all strings that I find very appealing. There's still enough bass for my fingerpicking style to keep me happy, and it's overall physical & tonal persona makes it a lot of fun to pick up & play. I don't know for sure what the last year of this model was - I think it might have been 2012. 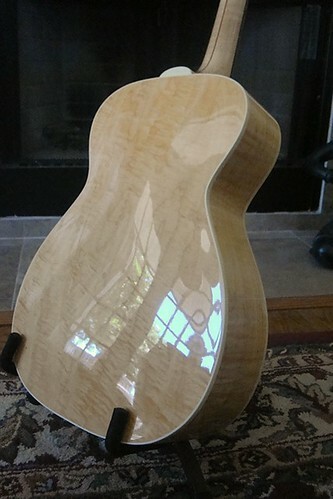 Gibson's current Parlor model appears to carry the same dimensions, but the body choices do not include maple (there are rosewood, mahogany, and walnut versions). The maple CJ-165 doesn't seem to come up too often, but if one does, it might be worth a look. Since we talk about maple, to me one of the nicest Guild maple models was Doyle Dykes 2013 Signature model DD-6MCE. It has a 15.75″ lower bout. I think the GC guitar is a GF-60, a little later version of your F-44. Yep, confirmed by s/n on back of headstock, and should have 1-11/16 nut. The GF30 I mentioned earlier would be the "blinged-down" arched back version. And as mentioned, both would be 16" lower bout. ALL the GF's were 16" lower bout, and anything "F--ce" will be, too, the numbers changed according to the body woods and depths. I'm still loving my GF30 -- it's been my main guitar nice I picked it up a couple months ago! Last edited by wileypickett; 02-11-2019 at 09:04 PM.